We have great decades-long experience in distribution, service and customer support in the plating and creasing machine business areas. After the first two SANWA cutting machines have been installed in Germany in 1989, only three years later we set up the first official German SANWA representation, which operates since 1995 under "Ulrich Meskes GmbH". Today more than 40 machines - spread all over Germany - are operational and prove SANWA's strong presence on the German market. Mr. Hartmann during an informative visit to Japan. 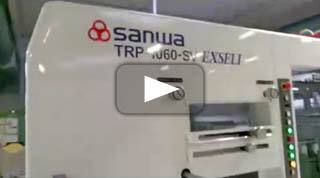 Recently the first SANWA TRP-1060-SV EXSELI machine in Europe has been installed at the Wiese-Behring company in Braunschweig. The video shows a test run using 90g paper.